I know...I know, I've already posted my pictures and recipe for my Shrimp Pasta. But I'm entering the first Tested, Tried and True hosted by Giz and Psych of Equal Opportunity Kitchen and I did not feel comfortable entering an event from a post way down in my archives. I take better pictures since I learned about the "little flower" close-up feature so it's better all the way 'around. And it's my blog and I can do what ever I want! But the Shrimp Pasta is excellent and it deserves a double take!! In a small sauce pan heat 1 c. EVOO and whole garlic cloves very slowly on low simmer until garlic is a light brown. Remove garlic. Heat 8 c. of water, 1 tsp salt and 2 T. EVOO to a boil. Add linguine and cook until pasta is tender but not mushy. Drain and put in large pasta bowl or platter. On your cutting board mash garlic cloves and add anchovy paste. Mash together until thoroughly mixed. Add the mashed anchovy and garlic to EVOO and reheat. When EVOO is hot add shrimp and heat for 1 minute. Remove Shrimp. Immediately pour EVOO over pasta. Add pepper and fresh parsley and toss. 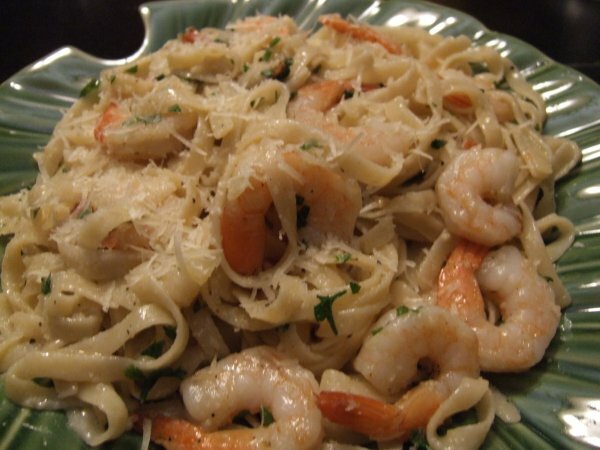 Place shrimp on top of linguine. Garnish with freshly grated Parmesan cheese and serve. I'm sure this tastes great. I make a similar dish that is always popular. I haven't added anchovies before. Does it add a lot to the dish? What is the "little flower"? Is that the micro feature on your camera? Thanks for participating in Tried, Tested and True! Yes psych...it's the micro feature. I received my new camera in the middle of a rather stressful time in our construction and promptly misplaced the User's Manual. Try the Anchovies...a taste like no other and SOoooooo good! !